This procedure will show you how to modify the attributes of a user. From the header menu, click the Settings icon and select Partner / Account > Users. Select the check box associated with the user you want to edit, and click Edit Select Users. Modify the group and user permissions as needed. 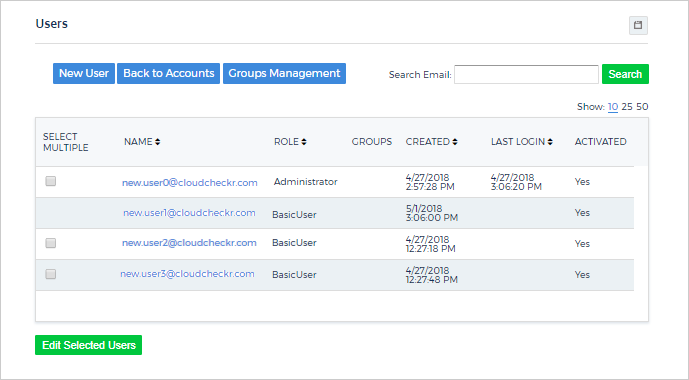 For more information, review the Assign User Permissions to a User and/or Assign Group Permissions to a User topics. If you do not want to see the user permissions, click Hide Permissions Grid. In the Permissions section, select a different role for the user if necessary. When you are finished, click Update. You cannot reverse user deletion. If you need to grant access to a user that was deleted, you must create a new user. To delete a user, click Edit Selected Users and click Delete at the bottom of the page.